Danza Fiesta: Baile y Teatro Puertorriqueño was created in 1998 by Gilda Rivera-Pantojas in New York City, with the idea of sharing Puerto Rican culture with the rest of the world. The company has been fulfiling it's mission through workshops, Community Programs, Performances and Lecture Demonstrations of Puerto Rican folklore and popular dances. Danza Fiesta features over 30 members, including dancers, musicians and creative contributors who devote a great deal of time and energy to focus on the study of Puerto Rican Folk and popular traditions and make it accessible to all people. 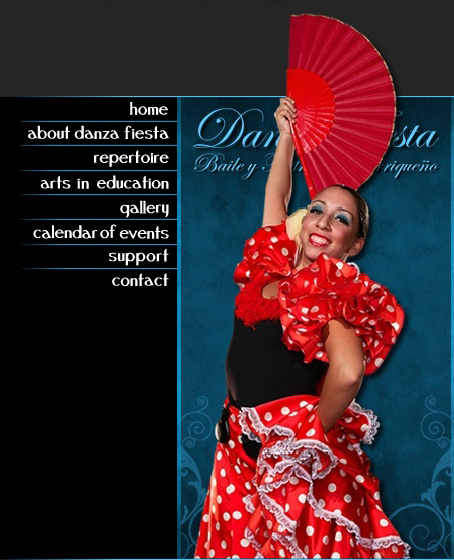 In 2001 Danza Fiesta became part of the non-for-profit organization Diversity in Arts in Nations for Cultural Education (DANCE, Inc.). for inquiries please contact us at info@danzafiesta.org. After more than thirty years as a dance teacher, professional dancer and choreographer, the founding of Danza Fiesta; Baile y Teatro Puertorriqueño was the manifestation of Gilda Rivera-Pantojas' lifelong dream to create a Puerto Rican Folk dance company, celebrating Puerto Rican culture and traditions with the rest of the world. Gilda Rivera-Pantojas was a dancer and choreographer for Gibaro de Puerto Rico for more than two decades in which she performed Puerto Rican folklore in many festivals around the world. She served as director and choreographer for the opening and closing ceremonies of the XXIII Pan-American Games held in San Juan, Puerto Rico. This event led her to the co-founding of Ballet Isleño in which she served as director for 8 years. Ms. Rivera-Pantojas has received a MA in Dance Education from Columbia University Teachers College and a BA in Theater and Dance from the University of Puerto Rico. Other accolades include awards from the Instituto de Puerto Rico in New York and the Puerto Rican Heritage House. She is presently a member of the Faculty at Boricua College and the Artistic Director of Danza Fiesta: Baile y Teatro Puertorriqueño based in New York City.